Our facility has been providing a repair services for Hamilton watches for over 20 years in Marina Del Rey, California. We take pride in your Hamilton watch and we always make sure with every cleaning that your repair meets Factory Specifications. Even if you just need a simple Hamilton battery change and waterproofing we can assist you. Here at Marina Bay Watch Co. our experts can change the batteries on your Hamilton watch and properly maintain the original factory water resistant properties. Changing batteries on a Hamilton is an easy task for our skilled experts and we maintain all the state of the art equipment to allow us to provide you with this service. One important factor in maintaining your quartz, mechanical wind, or self winding Hamilton watch is assuring that all the gaskets are not broken or dried up to assure yourself that your Watch will not leak from exposure to water. It is critical that your watch passes our water test to avoid any future water damage. 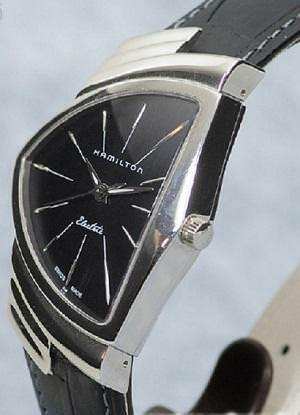 Service and upkeep on your new or vintage Hamilton is a critical part of maintaining your watch properly. Other Hamilton repairs and services offered by our company include full overhauls on mechanical wind and self winding movements, watch batteries, crystal replacements, crown replacements, dial refinishes, case and band refinishing, band repair, band sizing, clasp repair, clasp replacement, and many other services. All Hamilton Watch Repairs and Hamilton Watch Services include a 1 year warranty and it is recommended to service your Hamilton watch every 2-3 years.